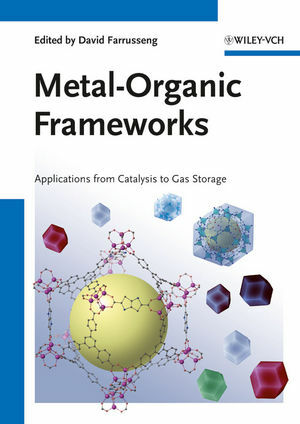 An international and interdisciplinary team of leading experts from both academia and industry report on the wide range of hot applications for MOFs, discussing both the advantages and limits of the material. The resulting overview covers everything from catalysis, H2 and CH4 storage and gas purification to drug delivery and sensors. A must-have for every scientist in the field. David Farrusseng received his BSc in chemistry from the University of Montpellier (France) under the supervision of Prof. R. Corriu. In 1999, he got his PhD in Materials Science at the European Institute of Membranes in Montpellier under the guidance of Drs. A. Julbe and C. Guizard. He joined as post-doc the group of Prof. F. Schüth at the MPI für Kohlenforschung (Germany). In 2001, he was appointed CNRS researcher at IRCELYON in the group of Dr. C. Mirodatos. He is currently group leader at IRCELYON. His research activities focus on the design of materials for original catalytic and separation processes and on the development of high-throughput approaches for which he was awarded in 2008 by the French Chemical Society. He is author of approximately 90 peer-reviewed publications and 15 patents.